Bistro-inspired as its menu may be, Café Chloe is not precisely a bistro. As popular as it is with the lunchtime business crowd, it is not now, never was and never will be a contemporary answer to late 1980s Dobson’s. Its iconoclastic, hip atmosphere, nods to locavorism and conscience-on-its-sleeve aura notwithstanding, it’s not farm-to-table, it’s not in North Park and it defies hipsterism. Whatever it is, Café Chloe seems more defined by what it is not. And that, in a sense, is its beauty. It’s individualistic, it’s sui generis and it’s its own thing. Café Chloe (721 Ninth Ave. in East Village) has the ambiance of a French bistro, perhaps not so much the look as the feel. Like many Parisian bistros, it’s a small place with multiple spaces around nooks, crannies, corners and up split-level stairs that plays—as a whole—somewhat larger than it actually is. That which is true with the space itself is reflected in the menu. There’s a steak frites, a steamed-mussels dish and a croque madame, if not a croque monsieur. And that croque madame—the French ham, the Mornay cheese, the egg—how perfect did that taste? It may not have been the most beautiful of dishes, but the flavors were spot-on; it’s a messy thing on the plate but beautiful on the palate. The mussels, though, were a more interesting dish. Instead of the moules marinière of classic bistro fare, this was a dish more likely to be found in a Spanish tapas bar: moules à la Valencienne, consisting of mussels sautéed with chorizo, fennel, saffron, orange and garnished with a sculptural slab of grilled ciabatta bread. Like the bistro classic about which I wrote in reviewing Hillcrest’s Au Revoir, this dish also featured a perfect balance between richness and acidity. But here, the sweetness of the mussels was underlined by the orange and fennel flavors, with the chorizo providing a hint of spiciness and a suggestion of earth. 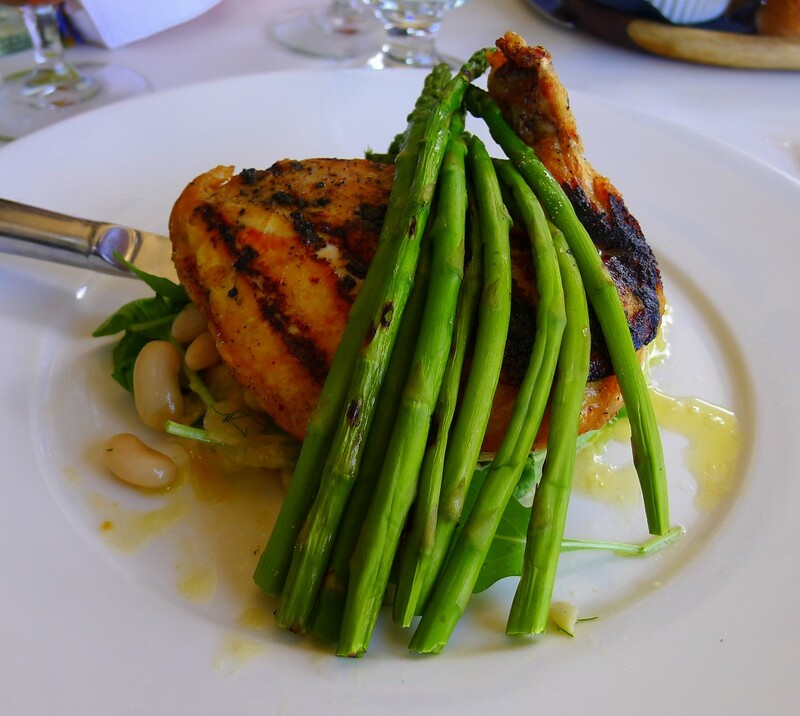 Another standout dish at Café Chloe is the grilled jidori chicken breast with cannellini beans, orange, fennel salad and grilled asparagus. The bracing fennel and orange flavor combination that had worked so well in the mussels dish may have worked even better with the grilled chicken and the earthy beans. The astringency of the asparagus, draped over the chicken breast, and the spiciness of the arugula in the salad below it tied the whole thing together. Not everything worked perfectly, though. While the flavor profile of the steak frites with herb butter, greens and Dijon vinaigrette was fine, the sear on the hanger steak was lacking, and the whole thing rested heavily on the perfectly done string fries. The tomato soup was tasty and rich, but too much cream dulled the flavor profile.